Smith, Kathleen Winnifred, 88, of Caledonia, Queens County, passed away peacefully at home on Friday, March 22nd, 2013. Born in Harmony, she was a daughter of the late Roland and Daisy (Shay) Minard. Kathleen was a loving wife, mother, grandmother and great grandmother. She was a member of the Caledonia United Church, U.C.W. and the Queens Seniors Club. She is survived by her loving husband Murray; daughters Barbara, of Ottawa, Ontario, Janet (Gary) Driver, of Stittsville, Ontario, Carol (Ken) Shannon, of Orlando, Florida; sons Bruce, William (Michael Lowe), both of Ottawa, Ontario, David (Jennifer), of Dartmouth; grandchildren Heather Watson, Robert Smith, Sara Hills, Jeffrey Smith, Jay Shannon, Kathleen Shannon, Heather Driver, Hannah Driver, Jackson Driver; great grandchildren William, Clare, Thomas and Bronwyn. She was predeceased by a sister Marguerite DeLong; brothers Lawrence, Wilbert, Clifford, Robert, Walter, Edgar and Ralph. We would like to extend our deepest condolences to all of you in the loss of such a wonderful person as Kay. She always possessed a smile and a kind word and was grateful for everything she had, especially her family. Our thoughts and prayers are with you all in this difficult time. We were so sorry to read of Kay’s passing. She always called us when she visited Ottawa, and told us all the news of home. Our sincere sympathy to Murray and family. My deepest sympathies for the loss of your mother. She was a lovely woman who always made me feel part of the family whenever I visited. I will always remember Kay with a warmth in my heart. My deepest sympathies to Murray and his family. Very sorry to hear of the passing of Mrs.Smith. Knowing the family for so long when they resided in Richmond I will always cherish the memories of Kathleen and know how deeply she will be missed by her husband & children & extended family members. Being a close family I know they will remember all the happy times they had with her during her life. My deepest sympathy to all at this time and wish I could of been in Nova Scotia with you all. So sorry to hear about the loss of your mother, Barbara. Our thoughts and prayers are with you and your entire family, during this difficult time. Barbara , I am sorry to hear of your mother’s passing. You’ve only spoken with love, warmth and understanding for both your parents. My sincere condolences to your father, you and your family. Barbara….Our thoughts & prayers are with you and your family at this time. Murray and family…we are thinking of you all at this very sad time. Kay was a very special person to us and we will always remember her with great fondness. Sincere condolences to Murray and all the family. My fond memories of Kay go back to when I thought of her as “one of the big girls” looking after us younger ones. May God’s blessings be with you all. Barb and family, So sorry to hear about your Mom. She was a lovely lady. Always open and welcoming and quick to share a laugh when your Dad said something funny (which was often). I know she will be greatly missed as a strong family leader as well. I have fond memories of the times I spent in the McBean Street “store”. My thoughts go to you all. Moms are so, so special. Barbara, we are so sorry to hear of the passing of your Mom. difficult time. Your in our thoughts and prayers. Barb, I am so sorry to hear about the passing of your mother. Please know that you are your family are in our thoughts and prayers as you go through this difficult time. Barbara, we were very sorry to hear about your mother passing. Please accept our sincere sympathies and know that our thoughts are with you and your family. 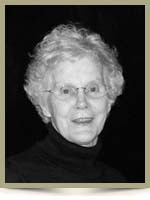 The Maritime Conference United Church Women extend deepest sympathy on the loss of your loved one, Winnifred..
May you always keep the memories of Winnifred in your heart and treasure them each day. May you feel the love and caring of your UCW family and know the they are there to support ,encourage and strengthen you. Kristine told me of your mother`s passing. Please accept my sympathies to you and your family. As you remember the love, as you mourn the loss, may you also celebrate the life. Hi Janet. Sorry to hear of your loss. Please accept my sincere condolonces. My thoughts are with you at this difficult time. So sorry to hear of your loss’ she will be sadly missed. We are so sorry to hear of your loss, please know our thoughts and prayers are with you. Sincere sympathy to Kay’s family.Our Thoughts & prayers are with you.Your Mom was a customer of mine for many years, one of the sweetest & kindest ladies I have ever met. She will be sadly missed. Cherish your memories as I will do so. Murray and family, please accept our sincere condolences in the passing of Kay. I have such fond memories of all of the Smith family visiting my Mom and Dad, Alwilda and George Zwicker, years ago. We had such fun playing with the boys at our home. I remember Kay as such a loving and special person. Our thoughts and prayers are with you all at this very difficult time.